The Best Stuffed Peppers are my mom’s. 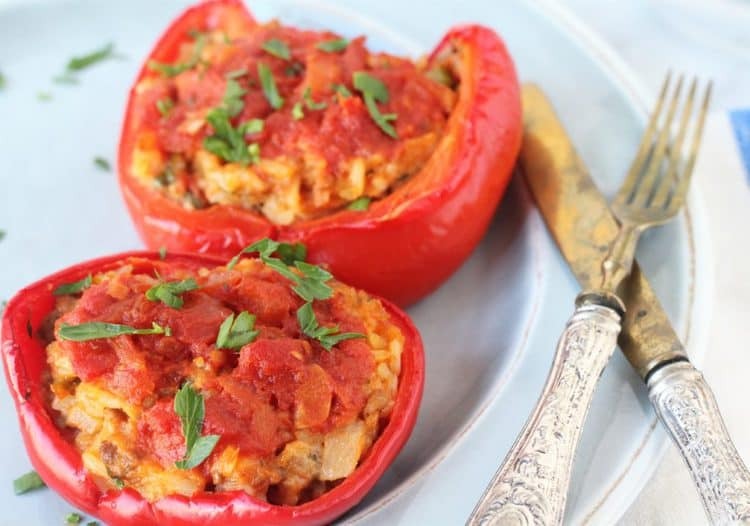 These Italian style stuffed peppers are cheesy, moist and simply the best you’ll ever make! 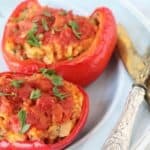 These are the best stuffed peppers you’ll ever make! How do I know? 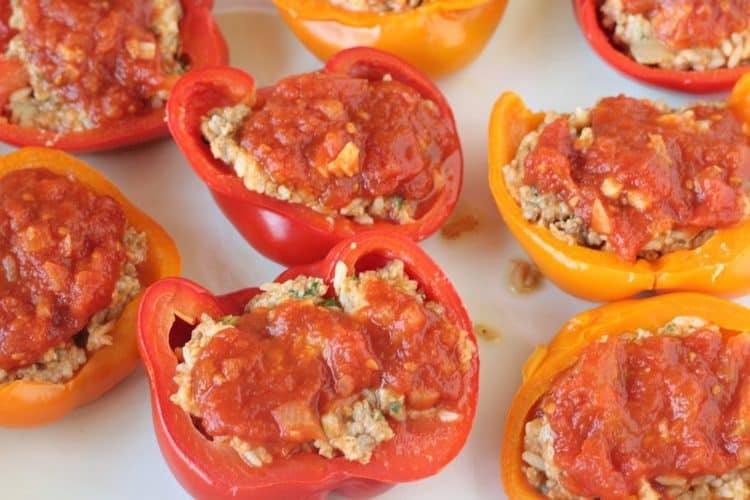 ‘Cause they’re my mother’s stuffed peppers! Obviously I’m a little biased since I’ve been eating these all my life. Of course, I started out eating only the filling and tossing the pepper aside when I was a child. But I’ve finally graduated to eating the whole thing. And now my daughter eats only the filling as well! Unlike most stuffed peppers that I’ve tried, the filling in these peppers is deliciously cheesy and not at all dry. That’s because they consist of the perfect blend of meat, bread, rice and cheese. I had to experiment with the amount of each ingredient since, as usual, my mother has no quantities written down. While most recipes for stuffed peppers use raw peppers, my mother always boils the peppers first in order to soften them. 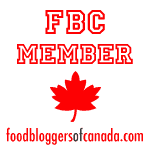 I do recall that my father was a fan of soft, over cooked vegetables! This is really a matter of personal taste and you can opt not to precook them. I decided to boil them for about 7 minutes before stuffing and I was quite satisfied with the resulting texture, not too crisp nor soggy. The great thing about this stuffing recipe is that it can also be used to stuff other veggies such as eggplants or zucchini, as my mother often does. You can also use leftover rice for the filling. I happened to have on hand leftover rice with peas in it which you may be able to detect in my photos. You’ll probably have extra tomato sauce after using what’s required in this recipe. So why not make some pasta with tomato sauce to serve alongside the peppers? Alternately, you can freeze it for future use. 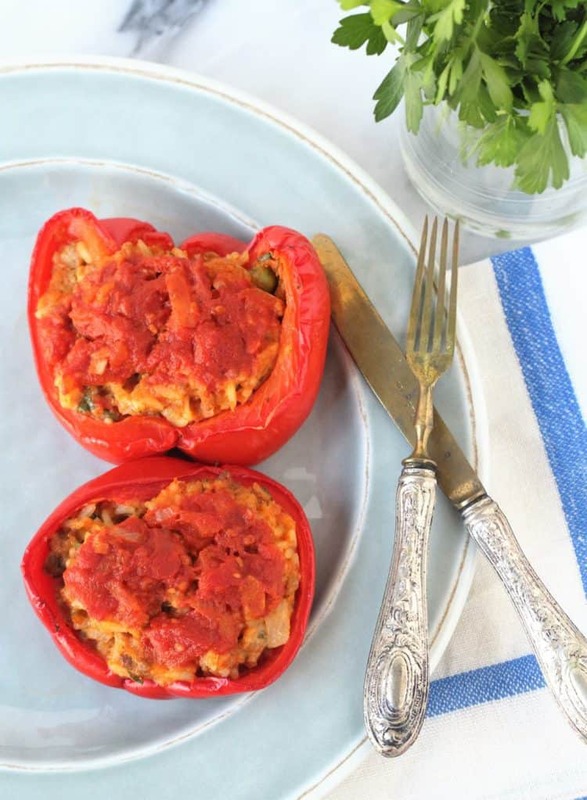 The Best Stuffed Peppers can be prepared in advance and simply reheated before serving. 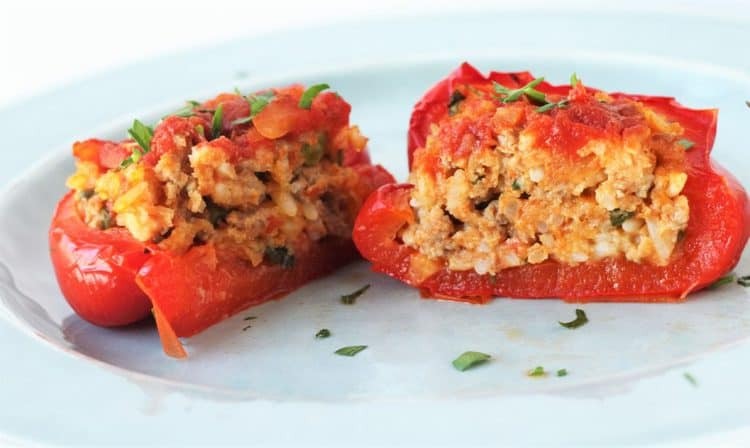 Let me know if you’ve tried out this recipe for The Best Stuffed Peppers by tagging with your photos with #mangiabedda or @mangiabedda or Facebook or Instagram! You can also pin this recipe for later. My mother's stuffed peppers are the best stuffed peppers. Filled with ground meat, breadcrumbs, cheese and eggs these are a perfect side dish. 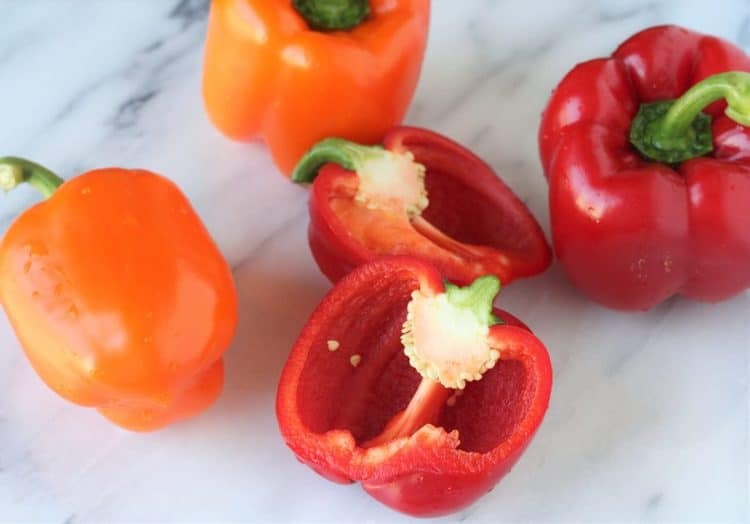 Cut each pepper in half, remove the stem, seeds and ribs. Boil for about 7 minutes then set aside to cool. Prepare tomato sauce: In a medium sized sauce pan, heat the olive oil. Add onion and garlic and sauté until translucent. Add the diced tomatoes and bring to a boil. Lower to a simmer and cook, uncovered, for 20 minutes. Add salt and pepper. Prepare filling: in a small skillet brown the meat until no longer pink. Transfer to a large bowl. Tear bread into small pieces (or alternately process in food processor) and add to the meat along with the rice, parmesan cheese, garlic, parsley, egg and salt and pepper to taste. Stir in 1/2 cup of the tomato sauce. Combine all ingredients well. Divide the stuffing evenly amongst the 8 pepper halves and place on a greased baking pan. Top each pepper with a tablespoon of tomato sauce. Bake for 1 hour. Serve hot. Leftover rice may be used for the filling. The filling can also be used for stuffing zucchini and/or eggplants. Freeze extra tomato sauce for future use or cook pasta and serve with tomato sauce along with the peppers. 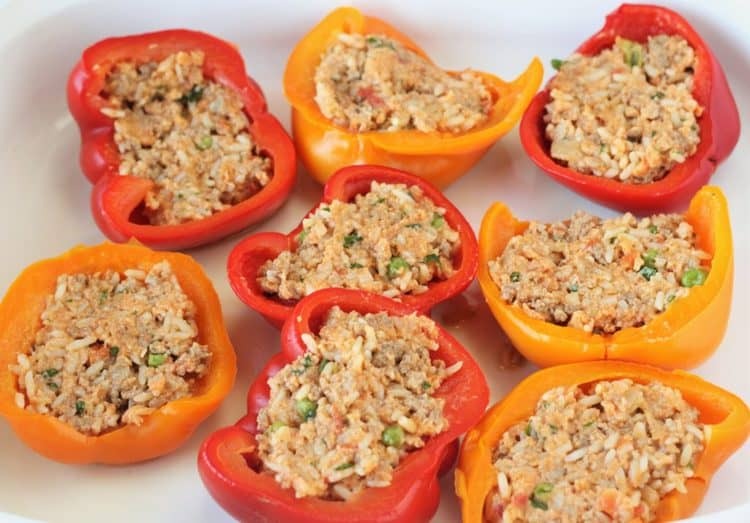 Stuffed peppers may be prepared in advance and heated just before serving. Yum! ???? Want some right now!